Is the U.S. economy at risk to suffer a "total economic collapse?" Is the US it under judgment by God? Some say that the collapse of the dollar is "inevitable" due to the enormous national debt. But what does Bible prophecy say about the US economy? More than you would think: a specific and very helpful amount. Find out how America actually will fall and what her financial status among the nations will be at that time so you can put the perennial fears of a economic collapse to rest. Is America doomed? Ever since the turn of the millennium, major new troubles have been multiplying for the USA. We've seen the Dot-com Bubble Crash, the 9/11 WTC attack, the U.S. Housing Bubble Crash and the Great Recession (which lasted far too long and is now in the rear view mirror thanks to the Trump Bump). Given all of this, many of my friends, Facebook contacts, and even readers of my book have expressed to me their concern that a "total economic collapse" is coming. Now even Trump is talking about "market collapse." He says if Republicans don't act and prevent him from being impeached, people will end up being very poor as a result of the US economy suffering from Trump's impeachment. Perhaps you are having the same thoughts? If so, you are definitely not alone. According to a recent NYT/CBS poll, 39 percent of Americans believe that the U.S. economy has now entered a "permanent decline." Another recent survey by CNN found that 48 percent of Americans believe that it is likely that another Great Depression will begin within the next year. News in the USA even saw stories of how people desperate for money were stealing just about anything that is not bolted down (manhole covers, copper wiring, air conditioners, etc.). Many Christians seeing these reports wonder if the nation is not under judgment from God? This kind of negative thinking and behavior is not without instigators. Doomsday appeals to fear show up periodically, especially in times of recession or uncertainty. 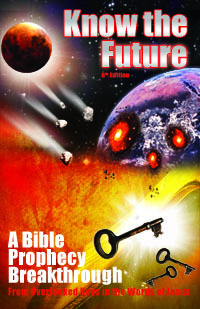 Back in 1998 when I started studying prophecy, the Year 2000 problem (Y2K) was in focus. Many people were convinced by Gary North and sellers of survival supplies that they needed to stockpile food, weapons, gold and silver to face Y2K. It turned out to be a poor investment when Y2K did not create the disaster it was expected to. Now, a little over a decade later, stockpiling is touted again, this time from new sources. For example, even the bestselling author of Rich Dad Poor Dad, Robert Kiyosaki, predicted an economic crash (“depression or hyperinflation”). Kiyosaki was so concerned about it that he has made the typical survivalist preparations for his household including guns (See video). It is not only secular businessmen who warn of a soon end to America. The idea is also common among Christians, many of whom believe it is predicted in the Bible. Christians also have reported independent visions, allegedly from God, of America's end. You may have read such visions like those of A.A. Allen and Dimitru Duduman. They portray America being taken down by her enemies because God's blessing and protection have left her. If those ideas are mistaken, there is still the Biblical pattern of God's judgment on wicked nations. This pattern is worrisome in the face of America's other trend of decline: morality. The depravity and increasing wickedness of American society mirrors that of nations in the Bible who were judged by God. For example, God eventually raised up enemies who came and conquered Ancient Israel and Judah for their sinfulness. This is also what the Bible prophesies for the mysterious end time nation “Daughter/Babylon the Great” of Jeremiah 50-51 and Revelation 17-18. Is America and Her Fate in the Bible? To sum up, we have a lot of people expecting the end of America and they envision it in two main ways. The secular perspective offers a mountain of reasons why an complete economic collapse is inevitable soon. The Christian perspective argues that a complete military defeat is coming at God's hand, also soon and inevitable. Which one is right? Of course, if you are an American like me, you hope “neither.” Neither of these pessimistic perspectives are what you were wanting to hear about your home country. You don't have to be an American to dislike the concept of such a large nation and its citizens going through such tribulation. Even selfishly speaking, the fall of America or the reserve currency of the world it produces would send the world into depression and chaos. Could something this devastating really happen to not just America, but the whole world—and soon at that? We do not have to be in the dark on this question if we consult the Bible and understand it properly. As many rightly argue, it would make no sense that a book that has predicted the fates of many empires in history does not have something to say about the greatest nation of the end times and, arguably, the greatest world-ruling hegemony of all time. That is not to say it will be easy to identify or that everyone will agree with your identification. Since 1998 when I first heard the idea that America is actually spoken of in the Book of Revelation, I have only become convinced with even better evidence. The prophecy of Babylon the Great from Revelation 17-18 was mentioned earlier. Many think this refers to the Roman Catholic Church, the Vatican, or even Iraq (home of Ancient Babylon, rebuilt by Saddam Hussein beginning in 1983). However, when you look at all the detailed clues and take them at face value, the best fit by far is none other than the United States of America. Reigning military power (Jer 50:23 - “hammer of all the earth” - the last “superpower”). There is much more proof than this for the skeptical. Check out this list of dozens of proofs that point to America being Mystery Babylon the Great (or find further unique proofs in my book). This positive identification lets us learn several things about America's future from the prophecy of Babylon. It leads to some good news and some very bad news. The bad news is that both Jeremiah and Revelation leave no doubt as to the fate of America the Babylon. They give us specifics about exactly how it will happen. Jeremiah tells us a great nation, even an assembly of nations, will arrive from the north (Jer 50:3, 9; 50:41; 51:48) and defeat her. Revelation tells us that the method of defeat will be fire and burning (Rev 18:8-9) and it will be in a single day (Rev 18:8), and completed within an hour (Rev 18:10). When you put these specifics together, it points to America's archenemy of the Cold War, Russia. The shortest distance between Russia and America is over the north pole. Russia still has the largest arsenal of nuclear missiles in the world to send in that very direction. Russia is allied with China who is also preparing for war with America over Taiwan. Together under the right conditions they could accomplish it (before Wormwood passes). But I know what you're thinking: Communism lost and collapsed and Russia became a democracy and would not want war now. The Cold War is over, etc. However, you have to look at what they are doing to prepare, not what they are saying. If you listen to the many high level Russian military defectors, they will tell you the Soviet war policy believes a nuclear war is winnable and they still have a plan for defeating the USA with a nuclear first strike one day. If you don't find the theory of Russia plausible, keep in mind that it is does not matter exactly who the culprit is; America has plenty of enemies. What matters is that the Bible says the greatest nation of the end times will be defeated swiftly in one day just in time for the Beast to take over in the Great Tribulation. (For full details, see Know the Future). That's very sad news to an American like myself; news that I am loath to share with other Americans. I'm sure most of you reading this are not pleased to hear it and are tempted to deny it or even to be angry at me for suggesting it. Yes, I know it's a huge downer; please don't shoot the messenger. The sad truth is that no matter how good America is to the rest of the world, in God's eyes it does not erase her extreme wickedness (see this article on America as Babylon for a complete explanation). First, from Bible prophecy we can determine that, contrary to what the groups mentioned above predict, America's end is anything but soon or imminent. Revelation 14 shows that America's military defeat does not come until right before the Mark of the Beast is released. In other words, when the Great Tribulation starts in the middle of the 70th Week of Daniel. The 70th Week of Daniel has not even begun yet. What's more, none of the 70th week prerequisite events have happened yet (Nuclear Middle East War, Third Temple, sacrifices for the Antichrist to stop, etc.). The defeat actually comes at the hands of the Antichrist and his “Ten Rulers” (Rev 17:16-17), right before he sets up his own global military and financial empire to fill the void America leaves. Revelation 17-18 depicts Babylon as a whore riding or controlling the Beast which is why the Beast needs to remove her to be free. The prerequisite events that the Bible describes have not happened and leave no time for it to happen until near the end of the 2020's (at the earliest...and very possibly at some other year later than that). The second piece of good news is that what Revelation tells us about the financial status of America on the day just before she is destroyed also precludes the “coming total economic collapse” theory. Like today, Revelation describes a nation that makes rich (Rev 18:15) the world's merchants and traders who ship to her every imaginable good under the sun (Rev 18:12-13). Like today, America will still be the biggest market for goods in the world up until the destruction. So much so that the merchants are pictured on that day as weeping offshore in their ships looking at the smoke of her burning and wondering who will buy their goods now that she is gone (Rev 18:18-19, 11). This tells us that there is no economic collapse of America apart from the total destruction of the nation. When we hear the latest theories for how America will soon end, it helps to realize that rumors of America's economic or military end are nothing new. No doubt people have been predicting this every year since the nation was founded. Meanwhile, America has survived a Revolutionary War, Civil War, two World Wars, Cold War, a Great Depression, and countless recessions. Although it we had the worst recession ever, the previous Great Recession ended just like all other recessions did, with a recovery—not a complete economic collapse. Under Trump we're even having a booming economy again. Although Revelation sadly depicts the military defeat of America one day, it tells us plainly that it will be an America that is still the economic center and wealth creator of the world economy, just as we see palpably today. A complete economic collapse of the dollar would ruin America forever and the world economy at the same time. The "US economic collapse" is contradicted by Bible prophecy! We can believe and fear the theory of economic collapse or we can believe what the Bible says about America's rosy economic future. If we believe the Bible on this and even God's will for our own personal financial abundance (John 10:10) then there is much hope for our future despite the current financial trial many of us are in. Q & A: "Tim, No Need to Stock Up on Food and Water, Etc?" The next article I wrote after this one answers the whole question of stocking up. Q & A: Loss of Manufacturing Base to Asia Reason For All the Ships? For a reader's interesting objection about the merchant ships coming as a sign of the economically devastating loss of our manufacturing overseas, see my blog post on America’s Fall: Why Does “Nobody” Buy the Merchants’ Goods “Anymore” After? How does Donald Trump and Putin fit into this? Will Trump truly be the last US President? Sarah, Trump won’t be the last president because the end can’t come (2026 at the earliest) until after a second term of his would end (Jan, 2025). History shows that speculation on current news events and leaders is not reliable. What Trump does with Putin probably will have zero effect on America’s fall. Russia has had the weapons to destroy America since the ’50s and has held back using them because it would hurt themselves as well to take out America’s dollar and the world economy with it. When Wormwood comes, that equation changes and it does not matter who is president or how friendly they are with Putin. Hi Tim, your comment was posted prior to the Sept. Rev. 12 sign, and the mysterious fires in CA. Are you aware of the important May 14 2019 date. The 71st anniversary of the figtree aka Israel’s rebirth as a nation? Christ says that day shall not pass without the rapture 1st. Just curious how you now see the landscape and timing of the rapture. Man has had opinions about everything since anything began and most of the time he is wrong. Jesus aka God manifest in the flesh has given the time of the rapture. What say you man? Wil, “The Rev 12 sign” 2017 was an invented prophecy that failed. Same with May 14, 1948 + 71 years. Neither are in the Bible but invented by Christians. “THIS generation” not passing was in front of Jesus in 30 until 70 and not about “THAT” generation in the future. yesterday was july 20th 2018, Trump is still on the throne in America. Hi, I just found this site today. Great info. Just curious if any of your views on this article have changed since I noticed you wrote it about 6 years ago. John M, thanks. Which views are you asking about? Revelation 18 has not changed in saying America falls while driving the world economy. America still does that. America’s nuclear destruction will still crash the world economy, yes? I was referring to the financial collapse in America. It appears it still holds true, especially with Trump making America great again and all that. I would imagine America will be brought to a very high level of comfort and commerce, no wonder it will be such a surprising catastrophe when the antichrist finally does bring it to destruction. Before that happens though, I would imagine that because of it’s greatness that will make it hard for people to want to leave when the 2nd/Greater Exodus presents itself. I think, because the mercy of Yeshua, on the remnant in USA, we ll most likely be taken out by an EMP, which will be a good thing. Cause then the populous will be stripped naked per se, and we won’t be distracted, in order for Yah to get people’s attention. Right now, why do people need God, we got good jobs , Facebook , etc…..
James, an EMP blast does not fulfill what Revelation 18 says about “burning with fire.” A straight nuclear strike does, however. Hi Tim, I do agree with your timeline but through much investigation into our economic future I am convinced that America is going to have a reset very soon. I am speaking of the dollar crash. The country will not fall but it will certainly hurt a lot of people who will lose their pensions and Social Security at least until everything gets back to normal, if it ever does. I don’t know how long they can prop up the dollar like they have been for years. I do believe we are Mystery Babylon but I don’t believe a monetary reset will be the end of America but it will hurt us severely. We have always came back from the last five times we have had resets but this one may be the worst yet. I believe our dollar is worth about .04 cents right now. I believe all inflation and recessions have always been done on purpose by the Banksters. They are the worst people on the face of the earth and they do control almost all debt through their banking houses. I have your latest book and it is spot on. God bless you in your work Tim. Your work is invaluable to so many. I think it is true that we are speeding to the end times. Thank you Tin. Come soon Lord Jesus. James, sounds like you think another recession is coming. Those we have every few years and it’s not what I’m talking about in this article. Another possibility: USA economy does collapse: another nation rises to take its place as the mystery Babylon. This later nation then undergoes military defeat and all the merchants of the world weep as prophesied in the Bible. What do you think of the very well argued interpretation by Joel Richardson about the city of Meca being the prophecied great Babylon instead of USA? I have purchased your book twice and find it and your articles to be fascinating. They strike a chord with me because you tie together God’s seven thousand year plan, the literal interpretation of scripture, Christ fulfilling the fall festivals, the fulfillment of Daniel’s 70th week, and the seven-year Sabbath cycle into one beautifully knit-together conclusion to history. I wonder, however, if Daniel’s 70th week doesn’t start off with the release of the four horsemen, i.e. the opening of the seven seals. It would seem that the Mideast War would result in people looking for salvation (or anyone claiming to be Christ), economic chaos, health epidemics, death and destruction; in other words, the first four seals being opened. Richard, The first four seals are already opened. The first one, the white horse is Catholicism or as Jesus said in the parallel prophecy, “Many coming in my name saying I am Christ and deceiving many.” Islam/Communism came out of the second seal taking peace from the earth. Etc as my book explains. Blessings to you Tim. I believe that a very critical verse is often overlooked and it does put America in the crosshairs of the abominations against our Savior Jesus Christ. America as a whole acts like a whore only working in her own selfishness the me, me, me type of society. We have turned away as a country the verse I’m speaking of is Matthew 6:24 for all who read this the Bible speaks of people choosing Mammon over Jesus Christ and we fit that perfectly. Great article as always, Tim. You always put my mind at ease. Hope you and your family are well, and your son has fully recovered from that terrible health crisis. God Bless! Great article Tim! Your eschatological roadmap is second to none by the grace of God. It indeed speaks peace. May I also comment here that the revelation not to proselytize is spot on. The result of which is like the fig tree with leaves but no fruit. The emphasis on bearing fruit that abides is paramount. Thanks again for another paradigm teaching. Tim’s argument(s) make a lot of sense. From an economic (cyclical) perspective America will NOT experience a “total economic crash” anytime soon. However, we are due for a downturn which some are expecting to begin sometime around November 21st of 2018 and will continue into the early 2020’s. Additionally, America’s preeminence is not projected to quickly wane UNTIL AFTER 2032 when the economic wealth will move from the West to the East (due to increased socialism/taxation/regulation in the West). There will be cyclical gyrations, as have always taken place, until that time—unless the 2024 Sabbath cycle is in fact the “one” (as Tim has mentioned many times). The Risk of civil war in the United States also increases once we breach the early-to-mid 2020’s as well. Throw in some panic periods (2020 and 2024) along with the potential of rapid global cooling during the same time and you have makings of a “wild ride” (to say the least). The collapse of socialism throughout the West is the primary contributor to much of what we’ll be experiencing. I started listening to some Robert Kiyosaki podcasts and videos over the past month and noticed he’s been pushing a financial collapse. Just today I remembered that about 2 years ago I stumbled upon this site while researching the same topic and had found this enlightening article and I actually commented above. Well, I just read through it again and found it funny that it even mentions Robert Kiyosaki in it. This was great to read again, thanks for all the great info you provide.